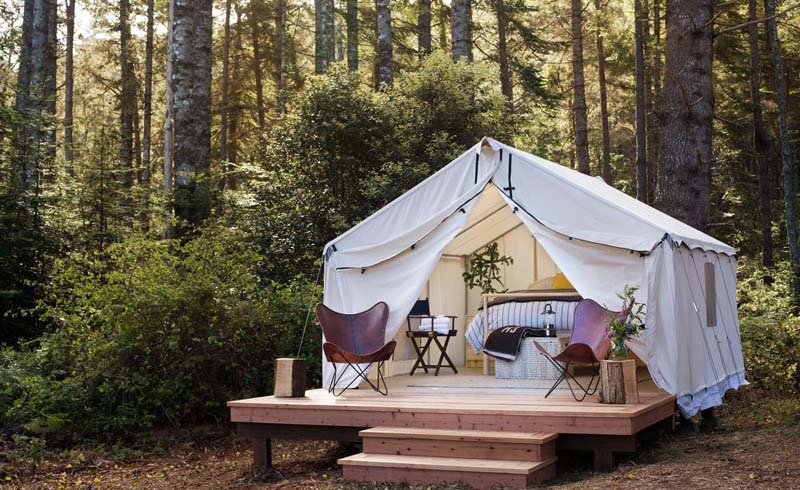 The 7 Best Places to Go Glamping in the U.S.
We love the great outdoors as much as the next gal, but we also love a warm bed, toilet paper and running water. Here, gorgeous campsites to book if you’re not ourdoorsy. Did we write a high school essay claiming, “For it is only in the majesty of nature where we truly discover ourselves”? You bet. But now that we’re adults, we also wouldn’t mind being one with the earth in a warm bed. (Hey, even Thoreau took breaks from Walden pond.) So if you want to escape to nature with the luxury of hot water and high-thread-count sheets, check out these seven gorgeous campsites. 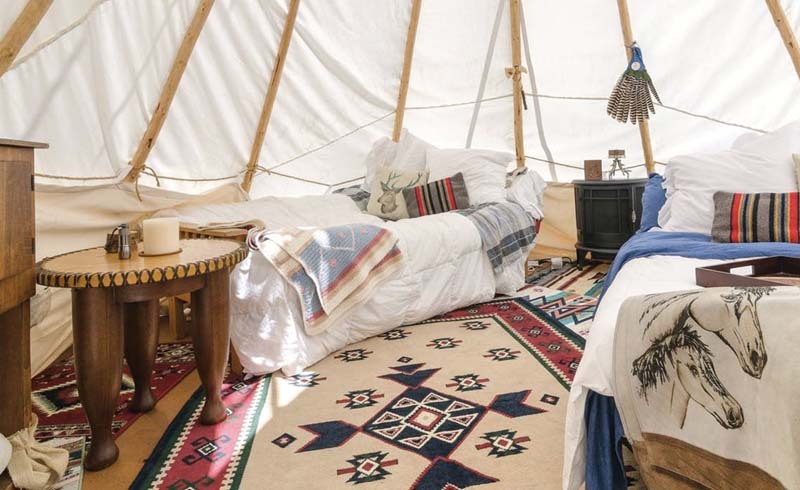 This tricked-out teepee near Malibu and the breathtaking Pacific Coast Highway has all the amenities you’d expect from a hotel—hot shower, continental breakfast and Wi-Fi—plus the perks of a rustic getaway. Ride horses through the canyon or indulge in complimentary wine and cheese in an outdoor hot tub under the starry skies. 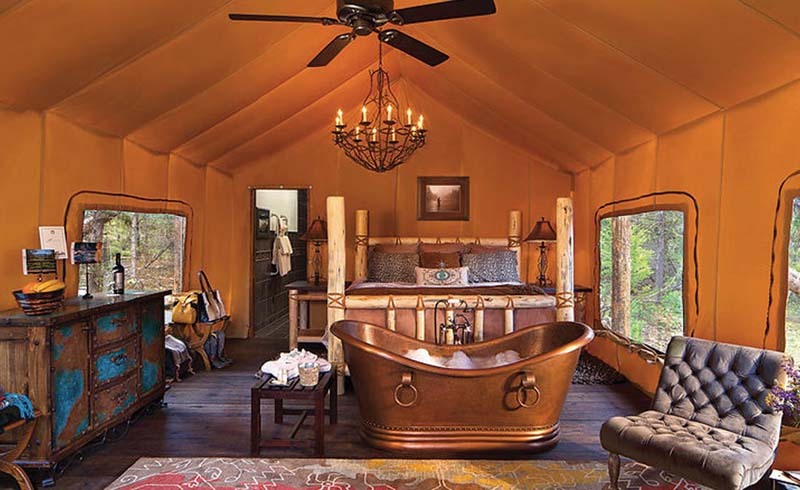 Yep, that’s a canvas tent with a chandelier and copper tub. 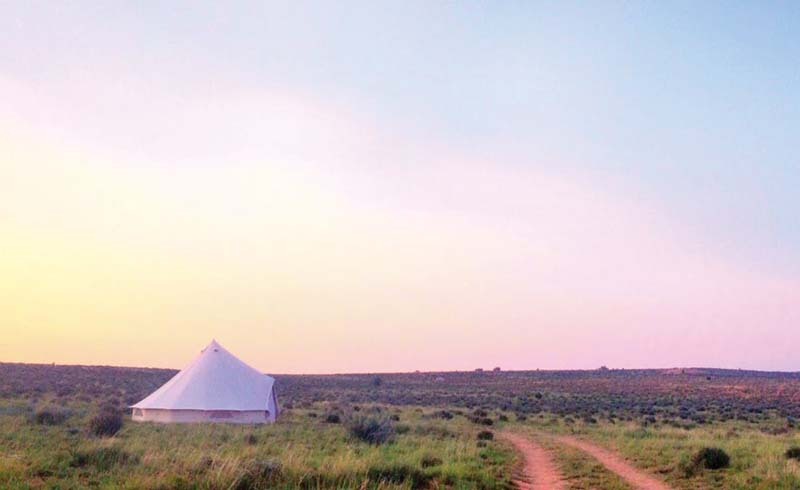 This luxe campsite doesn’t come cheap, but it does come with every amenity imaginable: three world-class meals per day, helicopter rides, wine tasting and an on-site spa so you can really enjoy the outdoors the way you were meant to (post-facial, of course). 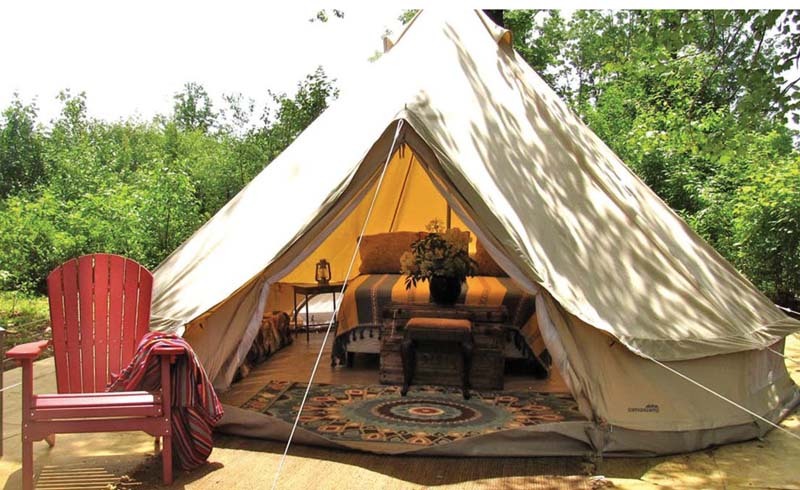 This large safari tent with hardwood flooring, mesh screens, king beds and 300-count sheets in upstate New York can be yours. There’s even a bocce-ball court, campfire ring, sauna, on-site restaurant and complimentary continental breakfast (including homemade granola, locally baked bread, freshly baked quiches and the camp’s own homemade coffee blend). If you find yourself daydreaming about West World (no, not just because of Teddy), this is the spot for you. 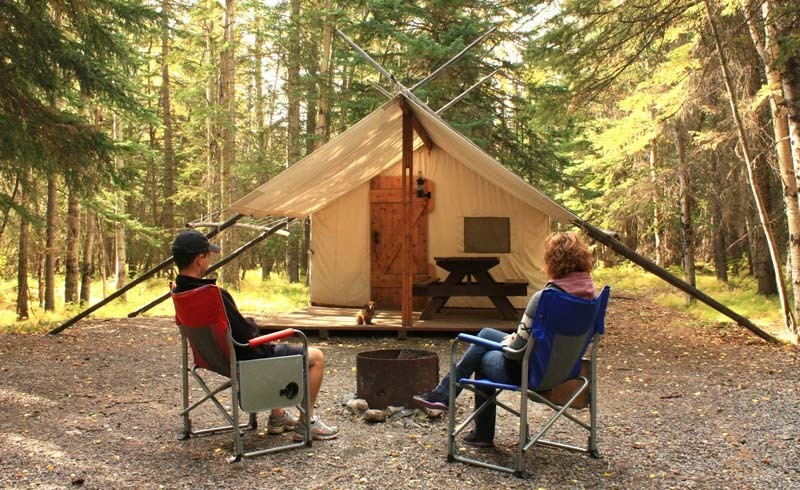 You’ll be cozying up in canvas-covered pioneer wagons for your stay on the shores of Bear Lake. But don’t worry—there’s also a games tent, spa-style bathrooms, massage tent, smoothie hut and restaurant all within reach. 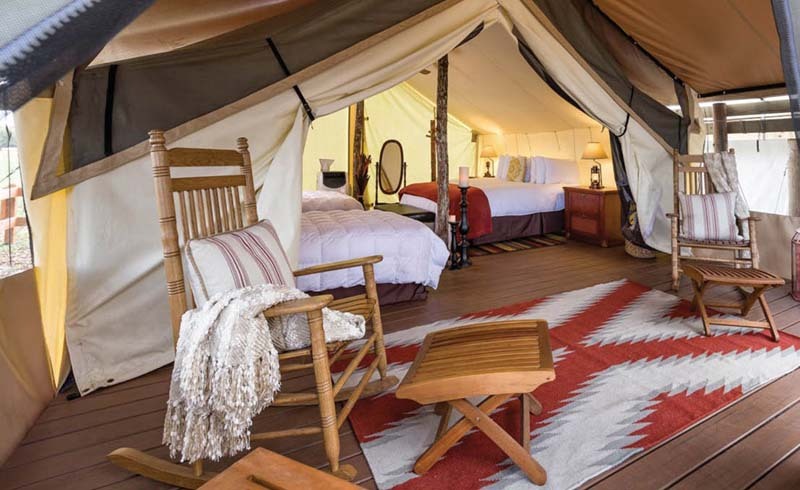 But if you’re really hankering for some seclusion, this canvas tent in the middle of the Navajo Nation is your best bet. Go off the grid to enjoy the flatlands of northern Arizona and watch the sun set over Antelope Canyon and Lake Powell. Bonus: A traditional Navajo breakfast is included daily in your stay. Escape to Bug Hill Organic Berry Farm in the heart of New England to pick wild blueberries and kayak around the property’s three-acre pond. 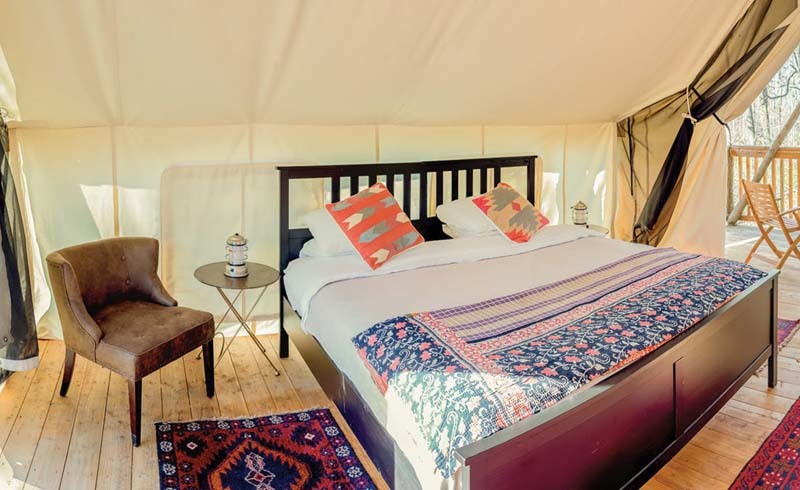 When you’re finally ready to turn in for the night (after all the campfire ghost stories, of course), a bell tent with a queen bed and an outdoor shower await you. This authentic dude ranch in central Florida is a far cry from Disney (although it’s only an hour away), but that doesn’t mean the kids have to be bored. Besides hardwood floors, AC, claw-foot tubs and fireplaces in many of the tents, the ranch has its very own ropes course, rock climbing wall, zip line, mechanical bull and bungee jump. 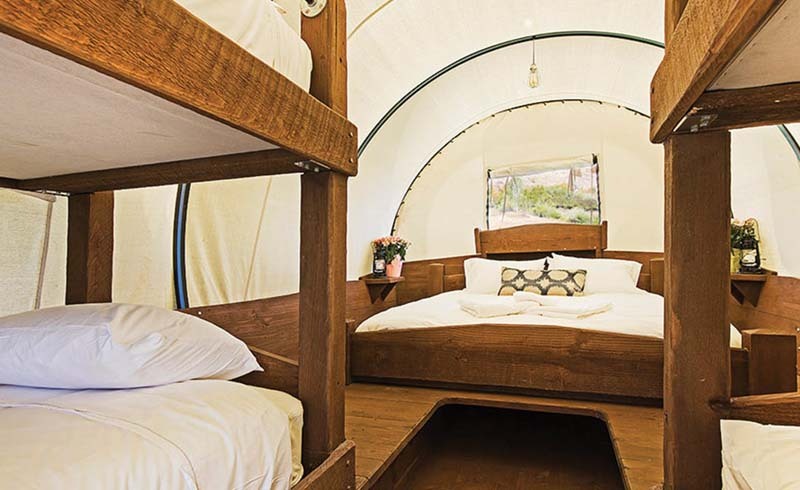 Travel Magazine: The 7 Best Places to Go Glamping in the U.S.